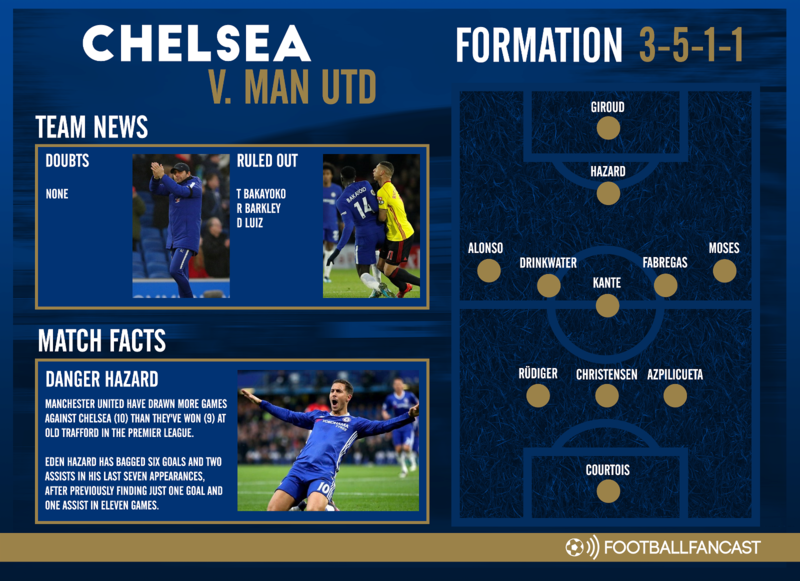 Chelsea face Manchester United at Old Trafford this Sunday in a clash that will have vital significance on the complexion of the top four come the end of the season. A win would see the Blues move on parallel points with Sunday’s hosts, while a defeat would leave them six behind and greatly reduce the chance of a second-place finish. Overall, Antonio Conte is spared from a burdening injury list this weekend. He’ll only be without Ross Barkley, who has barely featured anyway since arriving from Everton in January, midfielder Tiemoue Bakayoko, whose form this season has left much to be desired, and experienced defender David Luiz who has lost his place in the starting XI to youngster Andreas Christensen. That impacts Chelsea’s bench far more than the starting XI. Nonetheless, it remains to be seen precisely what game-plan the Italian gaffer opts for at Old Trafford. While Chelsea bizarrely lined up in a 3-4-3 without a recognised striker against Barcelona in midweek and obtained a decent result, Conte has preferred a 3-5-2 in big games on the most-part this term and we’re tipping him to revert back to it again on Sunday. Whether that will see Alvaro Morata or Olivier Giroud leads the line remains a matter of debate, but it will mean Willian comes out of the starting XI despite the 29-year-old producing a stunning performance against Barcelona on Tuesday night. The midfield, meanwhile, will be completed by Danny Drinkwater – joining Cesc Fabregas and N’Golo Kante in the engine room. The only other point of contention is in the left centre-back slot. We’re expecting Antonio Rudiger to keep his place, but after being rested in midweek captain Gary Cahill could return to the starting XI.